"When we tie up a belt or paper tape well, a knot that is called "Chiyo-Musubi" is completed. In Japan, it is said to be a lucky knot." This fine looking box from Hiroshi Iwahara of the Karakuri Creation group is a sliding puzzle box with two hidden compartments requiring 19 moves to open both. The interesting point about this puzzle box is that the slides which conceal both hidden spaces cross one another, so the resulting mechanism is much harder to produce than a standard box. Iwahara notes that the shape of this particular knot is a Pentagon, but it is also possible to produce a Heptagon. He's not planning to make a Heptagon version as a puzzle box though. Created back in April this year, and measuring 9.5" x 5" x 2.75" approximately, this is a big puzzle box, and it feels really solid when you're solving it. I don't exactly have small hands, and this box feels big to me when I'm working on it. I didn't do too well on my wood identification in the video, as the only thing I got right was the Walnut! 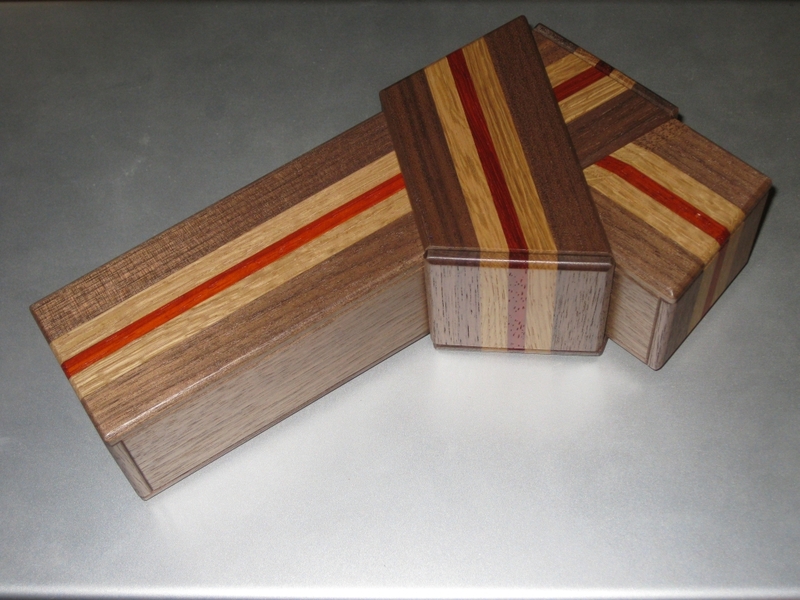 So to correct that, the box is made from Walnut, Oak and Angsana, giving it the striking appearance. To look at it, you really can get the feeling that someone has taken a plank of wood and knotted it like a belt. I borrowed this puzzle box from Derek Bosch (yes he has a good collection and has been very kind to lend me chunks of it at a time), so I'm not sure if it's just his copy or not, but the panels are fairly loose, to the point that when solving it, some of the panels would slide back to where I'd moved them from as I turned the box over in my hands. While it doesn't take away from the box, it can make it a challenge to open, as you have to be careful that panels don't slide around on their own as you move the box. Not realising that a panel slid back after you moved it preventing further progress can be a pain. This is a really nice puzzle, and I have to admire the design, especially the ability to have pieces passing over and under each other to make a very slick puzzle. If I'm honest, it's not my favorite puzzle from Iwahara, but it's by no means a bad puzzle! It took around 10 minutes to open the box and find both hidden compartments the first time. Having gone back to it later, I can see that this could take much longer as the order you open the compartments does seem to come into play, so I may have been lucky the first time and opened them in the correct order. Overall, a very nice puzzle and one which would certainly stand out next to other puzzle boxes, both for its size and striking contrast of woods.